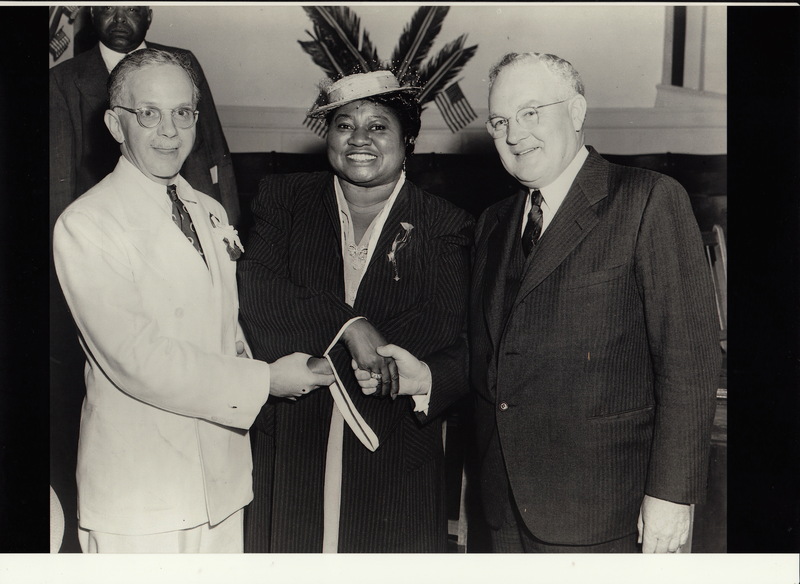 Walter Frances White and Hattie McDaniel (left, center) met only once, but they spent years obsessed with one another. They shook hands briefly during the summer of ’42, when the National Association for the Advancement of Colored People, which Walter headed, held its annual convention in Los Angeles. The Academy Award-winning actress also attended. I have to imagine that they got corralled into the picture by L.A.’s Mayor Bowron (right) because by then Hattie and Walter were on each other’s #*%@ list. A couple of years ago, I made the trek cross country to the Beinecke Library at Yale to learn more about Walter, whose papers are there. White was light skinned with blond hair and blue eyes, yet his family had black and white roots. (An ancestor was President Harrison, who before he became Commander-in-Chief, fathered children with one of his slaves.) Gutsy, Walter went undercover to investigate lynchings; arranged legal defense for the Scottsboro boys; and leveraged the might of the NAACP to advance black rights on multiple fronts, setting the stage for the Civil Rights Movement. Though it started in 1909, the NAACP didn’t gain momentum until 1915, when chapters began to form around the country to protest Birth of a Nation, which depicted black people as dangerous, ignorant brutes who had no business being free. The film glorified and reignited the Ku Klux Klan, which gave rise to Jim Crow, so the NAACP took the depiction of black people in films seriously from the gate. So when McDaniel won the Academy Award for playing Mammy in Gone With the Wind, she popped up on Walter’s radar as the most visible symbol of the kind of stereotypical role he wanted to shut down. To be fair to Hattie and the black actors who starred in the films of the 30’s and ’40s, neither America, nor Hollywood, was particularly enlightened about race. (I’m sure some of you are thinking, and they still aren’t, but stay with me here…) Hattie grew up in poverty, and struggled to keep her career afloat during the Depression, which lasted well into the 1930’s. She was, as so many were, grateful for steady employment. At the Beinecke, researching Walter, I saw a Yale student newspaper, which said something about Dean Kim Goff-Crews. I knew the name: She’s the great niece of Hattie McDaniel. I emailed her, and she told me to stop by. Her great aunt—through Hattie’s older sister, Etta–had died about a decade before Goff-Crews was born, but family memory of the parties Hattie threw; the way she doted on her nephews; and her legendary generosity lived on. The more I thought about how their energies became enmeshed, the less surprised I was that when I came looking for Walter, I also found Hattie. This is really, really good stuff, Pamela! More, please!!!! Intriguing. Can’t wait to read how it unfolds.